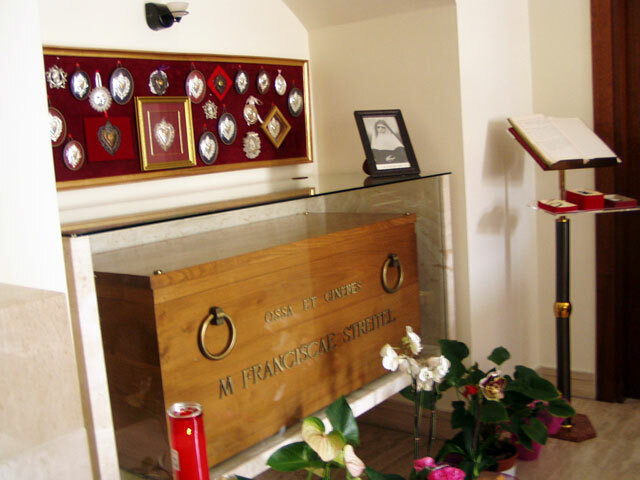 In 1937, twenty-six years after the death of the Servant of God Mother Frances Streitel, the Bishop of Nepi-Sutri, the Venerable Bishop Luigi Maria Olivares, initiated the first phase toward canonization, the Diocesan Informative Process (collecting information). Father Aquilino Reichert, OFM, Conv., was appointed as Postulator. Because of the long period of time between Nepi and the documented testimony from the sisters who had known Mother Frances, three other Rogatory Processes (additional inquiries) were held. The first process took place in Würzburg, Germany; the second in Paterson, New Jersey (USA), the third, in Winona, Minnesota, (USA). All of this material was included in the Positio Super Causae Introductione (1946) and sent to the Sacred Congregation of Rites. The consent given by Holy Father Pius XII for the opening of the Cause and Apostolic Process dates back to June 13, 1947, but was interrupted until March 30, 1963, when Blessed Pope John XXIII gave his consent for the continuation of the Cause. Under the direction of the Relator F. Peter K. Gumpel, SJ, the Cause was reopened and in 1994 F. Gumpel was replaced by F. Ambrogio Eszer, OP. Under his leadership, Sr. Therese Marie Mueller of the Sisters of the Sorrowful Mother completed the Novissima Positio Super Life, Virtutibus et Fama (i.e. The new proposition: An Extraordinary Life and Reputation of Virtues). In 2003, the general council appointed Sr. Therese Marie Mueller as Postulator for the Cause. The Novissima Positio was submitted to the Historical Congress on February 24, 2009 and on May 15, 2009 unanimously passed the scrutiny of the theologians. The Commission of the Cardinals and Bishops of the Congregation for the Causes of the Saints, 20 persons, met on Tuesday, January 19, 2010 and unanimously gave a positive vote regarding the Heroic Virtues of Mother Frances. On March 27, 2010, His Holiness, Pope Benedict XVI authorized the Congregation of the Cause of the Saints to promulgate the Decree of the Heroic Virtues of the Servant of God, Mother Frances of the Cross Streitel. with the firm trust of being heard. in honor of this Your servant and for the salvation of my soul.